Most people have heard about the concept of customer lifetime value, but few have actually computed it for their own customers. They feel that they lack the data needed to do the computation. Even if they were able to create produce a number, most people don’t know what to do with it once they have it. After you finish reading this article, you should be able both to compute customer lifetime value, and use it in your marketing strategy. To understand lifetime value, let’s take a hypothetical situation. Let’s compute the lifetime value of a group of newly acquired Hertz car rental business (not consumer) customers. (Note: the numbers are illustrative and not derived from Hertz. Hertz is used here as an example of how a well known and well run company would go about this process.) To determine lifetime value, you have to create a database which enables you to track customer purchases from year to year. If we can assume that Hertz has done this, they can look at their database after a couple of years, and create the following table. We are assuming that Hertz has spent about $20 per person (in general advertising and promotion) to acquire 100,000 customers. Of these newly acquired customers, only 50,000 (50%) rent a car from Hertz in the following year. Of these remaining 50,000, only 30,000 are still renting cars in the third year. We have just determined the Retention Rate — a key component of customer lifetime value. For Hertz it is 50% in the first year, rising to 60% in the second year year. This is an important number which we will refer to later when we plot Hertz marketing strategy. It is projected above that the retention rate will rise to 70% in the third year. These newly acquired customers spend an average of $160 each in their first year. Those who remain for subsequent years (the loyalists) increase their spending to $200 and $240. TheSpending Rate is the second component of lifetime value. Putting these numbers together, you can see that Hertz gross revenue from these 100,000 new customers is $16 million the first year, $10 million from those who remain in Year2 and $7.2 million from the remaining loyalists in the third year. The cost of servicing customers tends to go down over time. The first year, it costs Hertz about 60% of revenue. For those customers who last into subsequent years, it goes down to 57% and 55%. If we include the initial acquisition cost ($20 per new customer), we can then determine the total costs in each of the three years. Profits, of course, are equal to revenue minus costs. Looking at the gross profit line, we can see that these 100,000 customers produce a gross profit of $4.4 million in Year1 and $3.5 million in Year2. We need a way of adding profits from different years together if we are going to compute lifetime value. The method is to use a discount rate. The discount rate is used to reduce assumed future profits down to their net present value. The discount rate is based on the rate of interest, and is usually doubled to include a risk factor. The formula is D = (1 + i)n where i = the annual rate of interest including risk, and n = the number of years. To compute lifetime value, we have to determine the net present value of the cumulative profit from each customer over each of the three years. This cumulative profit is then divided by the original 100,000 customers in each case to determine that the lifetime value is $44 the first year, rising to $103.33 in the third year. This chart is similar to the last one, but it has significant new features. In the first place, the retention rate is now 75%, instead of 50%. This is a typical result of a successful marketing strategy — it should improve the retention rate. If your strategy does not increase the customer retention rate it is probably not a very good one. In addition, the spending rate is much higher: $210 instead of $160. Why? Because with a successful strategy, you are likely to get a much higher percentage of your customer’s business, instead of just a portion of it. How does Hertz determine what the new retention rates and spending rates are going to be? They make a guess, based on tests. One of the advantages of database marketing is that you can experiment and subject the planned changes to small scale regional tests that provide valuable insight without alerting your competition of what you plan to do on a larger scale. Hertz certainly tried this strategy out before going national with it. There are two new lines added: the referral rate and referred customers. Almost any worthwhile strategy that you can dream up — if it is working and popular with customers — will lead them to recommend your company to their friends and relatives. I have told hundreds of people about the Hertz Number One Gold Club. You can even incentivise your customers to enlist others as Verizon Wireless does by offering free in-network calling. The lifetime value in Year3 has risen from $102.33 to $125.97 What this means to Hertz is an increase in profits due solely to the new strategy by nearly $23.6 million after all expenses have been paid if 1,000,000 customers become club members. This chart does not prove that the club will be a success. It might fail through poor execution. What it proves is that the club might be a success. Many such tables have been drawn up which prove that proposed strategies could not succeed, no matter how well they are executed, because the costs exceed the benefits. This is the purpose of performing a lifetime value analysis and constructing such tables. The lesson: before you embark on any new marketing strategy, first build or tap an existing customer database, and then create a base lifetime value table. When you know the base lifetime value, you should then use your imagination, and some carefully constructed tests to create a new lifetime value table assuming that your strategy is successfully implemented. 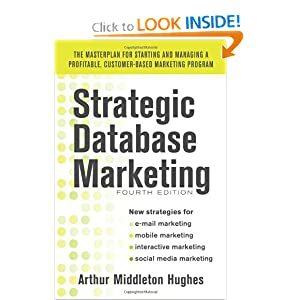 You will soon see that there are only five ways in which database marketing strategies can increase lifetime value. They can increase the retention rate, the spending rate and the referral rate. They can also reduce the direct costs (in some cases) and the marketing costs. Use your new lifetime value table to evaluate your strategy. Don’t spend any serious money on a new project until this analysis shows that you have the potential for success.